I had the privilege of spending some time with Dr. Howard Purcell when I visited the headquarters of Essilor. 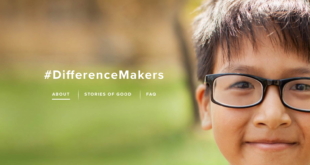 I was encouraged by the large role an optometrist has in influencing Essilor’s management and community. Dr. Purcell says that although the management team has very different personal and business backgrounds, the varying experiences they bring together enhances the company. Dr. Howard Purcell has been at Essilor since 2008 and serves as the sole optometrist on the management team. After graduating from New England College of Optometry, he worked in his father’s optometric practice, and held positions at both NOVA and Vistakon. Dr. Purcell is an extremely intelligent and charismatic guy, whose main flaw seems to be his love for the Miami Heat (haha). Prior to our meeting, I researched his accomplishments and contributions to the industry. He has led the discussion of the role of e-commerce within optometry the last several years. We discussed the future of our profession, changes in the industry, and Essilor’s role in all of it. 1.Essilor is for “partnership, innovation, and choice.” What are the plans of Essilor for the future? “Those are the pillars of the future for us…When we bought our first lab, and that has been a successful endeavor, it was controversial. We are buying a lab, and we are going to sell our products to labs we don’t own. Will they still want our products? We are competing with you everyday for lab services, and yet you still carry our product. It proves the value of the brand. “As we talked about our acquisition moving forward, particularly in the independent space, because that is critically important to our future, innovation is key. We will continue to innovate and utilize technologies to improve the whole experience of going into a practitioner’s office, getting an eye exam, being evaluated, and being prescribed a product. We have to make that a better experience. 2. Technologically speaking, what will be the biggest development to change eyecare and spectacle lenses in the coming years? “I believe the eye exam is too easy. What we use as a standard today is snellen acuity, 20/20, which was established in the mid-1800s, and the standard by which we hold people to vision performance. The human visual system can do far better than 20/20. The visual system can do 20/8 with a perfect retina, and the maximal number of cones in the macula. 3. Do you think that development will come from the eye exam or the eyewear component? “The eye exam of the future no longer has a chair, a stand, or a phoropter. The eye exam of the future is a virtual reality device that you put on your face and if you drive a car, work on a computer, play tennis, I’m going to immerse you in those environments, and I’m going to assess your visual performance. I will be able to scan your retina and check your intraocular pressure. Things that today require big pieces of equipment that can be consolidated into something more manageable and much more fun and engaging. 4. A company in Denmark has produced 3d lenses, does Essilor have any plans for production? If so, how will this change the industry? “3d printing of frames has been done for long time. Very shortly, we will see the ability for someone to come into our offices and create a frame for them based on their facial features and desires, even utilizing known brands. That, for me, is in the short-term. 5. Essilor recently launched Eyezen™, an anti-fatigue lens marketed to millennials. What can you tell us about the lens, the science, and the launch? “Eyezen is a very different product and approach to the launch for us. In terms of product, what we wanted to try to create is something that addresses a fairly significant need: the time we spend on digital devices. The human visual system is being challenged. We want to find a product to relieve some of that stress and fatigue. In addition, we know there are harmful effects from blue light emitted from the devices. 6. As a practice owner, I see managed care as the biggest challenge to optometry, how does Essilor see its role in managed care? “Managed care is a challenge to everyone. From an industry standpoint, we are a customer of these managed care plans, and we find it a challenge at times to maintain profitability with the business models we have been accustomed to using. These are issues we will continue to face. Essilor’s position on this is how do we find ways to help our customers navigate through that. We have a group called our IHMS group whose sole purpose is to help Essilor and our customers better understand the issues, opportunities and challenges around managed healthcare. 7. Is there any truth to the rumor Essilor is to acquire a managed care plan? 8. What do you see as the major challenge facing the industry for new grad ODs? “The two biggest challenge are built around the desire. Our data tells us between 70-75% of graduates want to go into private practice. Our biggest challenge as an industry today is to find those opportunities. You are a great clinician when you graduate, but you’ve never run a small business. The challenges of running a small business are significant, more significant than when I got out of school, and will probably be more significant five years from now. At Essilor, we look carefully at both of those areas. We provide funding and we have a business simulation that we can utilize to allow a new grad to own a virtual practice, to make decisions and to look at the implications of those decisions over time. It gives the opportunity to experience ownership. We want to be there to support them every step of the way. 9.Why do you think a new grad practice owner should use Essilor lenses? This is your chance to brag. “I love to brag. We have the best products, but it’s more then that. When you are partnering with a company, you have to look at their culture. You have to look at how they act; not what they say, but what they do. I am proud to tell you that out of any company in the industry, we are looking to grow the industry. Two examples of that are the Think About Your Eyes campaign and consumer education. Think About Your Eyes is something the industry has wanted for years and years and was tested here in Texas. Doing a generic advertisement on the importance of the eye exam, and no products were involved at all. Driving people in to get their eyes examined has been an incredibly successful campaign. 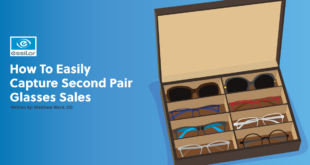 There is no one else on the spectacle lens side that is going to the consumer to help them understand there are differences in product, and make it more evident to them that progressive lenses, photochromic lenses, polarized lenses and AR are important, and the value they bring. We put our money where our mouth is. If you are a new grad and you are looking for a partner, look at product, assess a culture, and look at who is supporting you and growing the industry. 10. Pertaining to e-commerce and my online optical.com, how do you see this incorporated into practices in the future? “After seven years of research, it’s clear to me that omni channel is the future. Look at the big players in e-commerce; they swore they would never open brick and mortar because it affects their profitability. Showrooming is going into the office taking all the measurements and then I go home and buy online. That is actually not what is happening. Web-rooming is when I want to go online and learn. I don’t want to walk in and know nothing about a product that I’m about to buy. There are certain products I’m not comfortable buying online. E-commerce will grow, but the independent eyecare practitioner is in perfect position to offer their patients an omni-channel approach. Offer their patients a virtual try-on, go online, and then come to the office and make the purchase. I think that is where we will see a lot of movement. Having said that, I think we are at a tipping point. Optometry still has a short window to engage in a big way, but if we don’t, we will be playing catch up. The fact is, one-third of growth in the eye care industry is coming from e-commerce. That is something we have to pay attention to. 11. Do you think every independent practitioner should have an online optical? “I’m not comfortable today selling progressive lenses online. I am very comfortable selling plano sunwear online and offering a virtual try-on to people so they can narrow down their selection. It works to everyone’s advantage. If I can narrow down my selection before I walk into the office and know what I like, it helps everyone. Yes, we all need to have a presence; the extent of that presence is a personal choice. Offer contact lenses, plano sunwear, offer a virtual try-on to bring value, and see how that works. We know your patient would rather stay with you, utilize an e-commerce solution, than to google ‘eyeglasses’ and find someone they don’t know. We are in a great position to retain patients already in our practices…How many businesses do you know today that consider themselves successful businesses that don’t have an online presence? Very few today. 12. What can you say to ease practitioner fears of Essilor’s online expansion and competition i.e. Coastal? “We saw this opportunity in e-commerce. As a result, we could either build our own solution or acquire a solution. Instead of building from scratch, we acquired. That acquisition was as important for our independent practitioners as it was for our business. I believe everyone needs a digital presence. This goes beyond online optical. Essilor always looks ahead 5-10 years and determines what threats are coming. We see a threat, and we have to address it. 13. Essilor recently acquired Vision Source. What does Essilor hope to bring to Vision Source doctors? “I truly believe when we look back after five years or so, we will view the acquisition and the aggregation of independent optometry as a watershed moment. Our team will do everything possible to make sure that’s true. 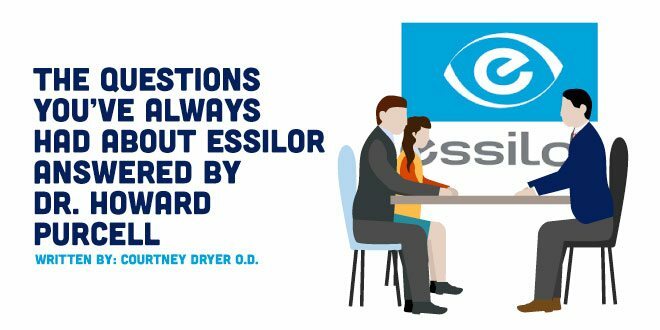 Do any have any questions about Essilor? Any questions for Dr. Purcell? Please comment below. Courtney Dryer is a 2011 graduate of SCO. She opened 4 Eyes Optometry in her hometown of Charlotte, NC in February of 2013. After 5 years, the practice name was changed to Autarchic Spec Shop to renew the practice's commitment to independent optometry. In addition to consulting with new graduate optometrists on start-up practices, she contributes regularly to New Grad Optometry and has guest blogged for Invision Magazine. The unique design of her boutique practice was featured in Women in Optometry. In 2015, Vision Monday named her a Rising Star, and one of the most influential women in optical.